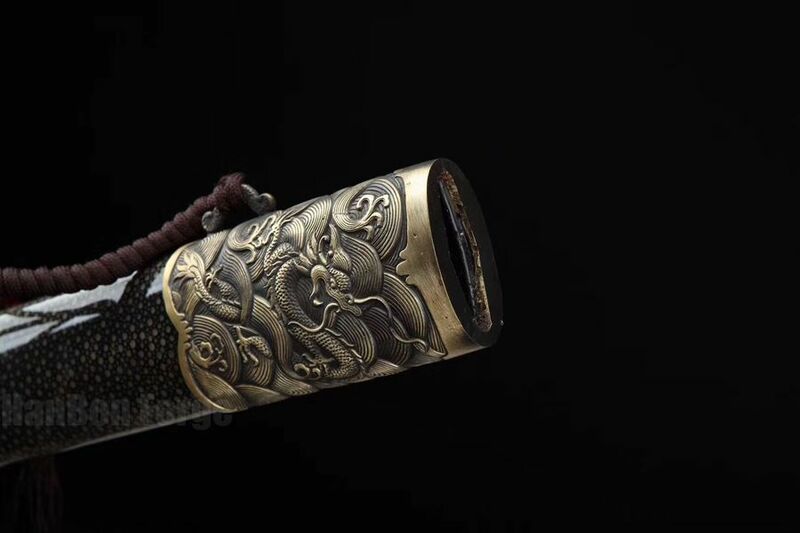 The blade of the Dragon Design Jian (剑) has been constructed in the Damascus Steel folding technique, which is folded 13 times and creating 8,192 layers folded pattern. The hamon of the sword is authentic after claying tempered. 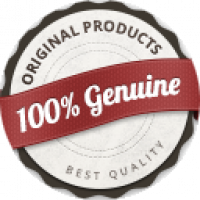 It features full tang and double sharpened edge. The guard and matching fittings are made of brass with hand carving dragon design. The scabbard and handle are hard wood wrapped with black genuine rayskin. This Jian sword is sharp enough to cut through fresh bamboos, small trees, straw mats. This Chinese sword Jian(剑) is hand forged and hand sharpened using old Chinese method to create a perfect blade. Fully functional and battle ready. The accessories of the sword are all authentic. The blade was made of folded steel. 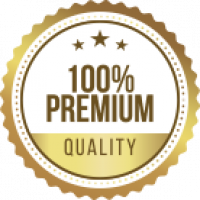 AISI 1060 High Carbon Steel are folded 13 times creating 8192 layers for superior strength and flexibility. The visible tenuous undulating grain on the blade was resulted from folded repeatedly during forging. The double edges of this blade was also clay tempered, you.. 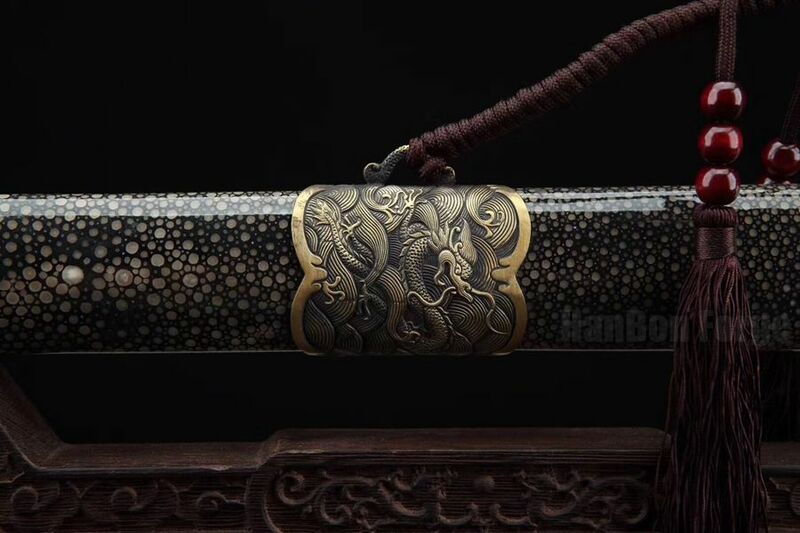 This Jian sword is finished with a replica of an antique brass fittings with hand carved dragon & phoenix design patterns. The blade is eight-sided and is highly polished forge folded steel with around 8,192 layers. A brown silk cord is tied around the upper half of the scabbard. The scabbard throat has been seamlessly fitted to the guard. The guard is also hand carved brass, and displays intricately detailed dragon and phoenix. The handle is made of ebony, with exquisite brass fittings. Thi.. This sword design fllowed the sword of "Yongle". Yongle was a hero of the third Ming Dynasty emperor Yongle (1402-1424), who moved the Capital City of China from Nanjing to the present location of Beijing. 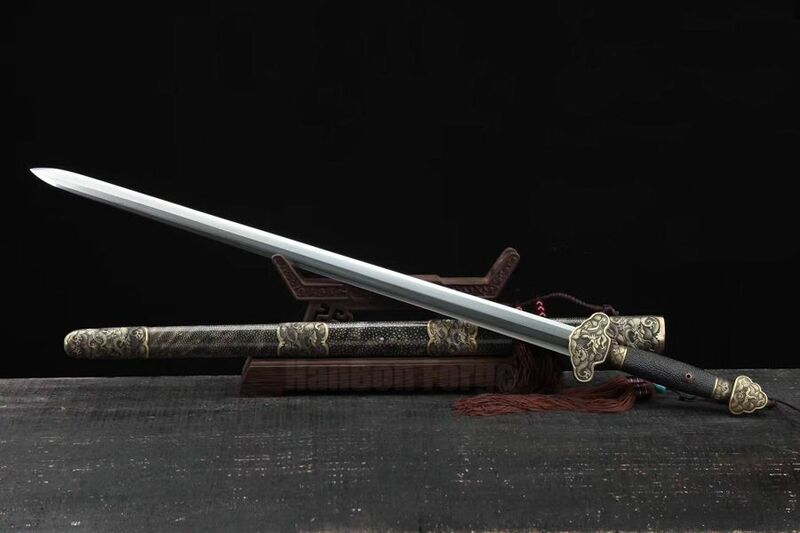 The blade of the Jian sword has been constructed from Damascus folded carbon steel with no hi, giving the blade clearly visible folding patterns. The hamon is authentic all the way up to the tip by clay tempered. Blade and handle made of one block of steel without welding. It features a brass .. 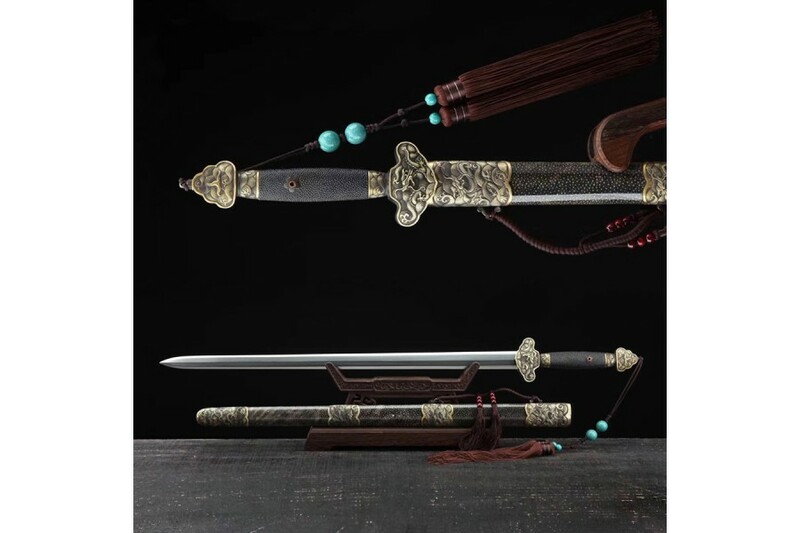 The blade of this Lion Jian sword has been constructed of Damascus folded steel, it features 8192 layers grain pattern (HADA). The blade is hardened, hazuya polishing and hand sharpened with double edge. 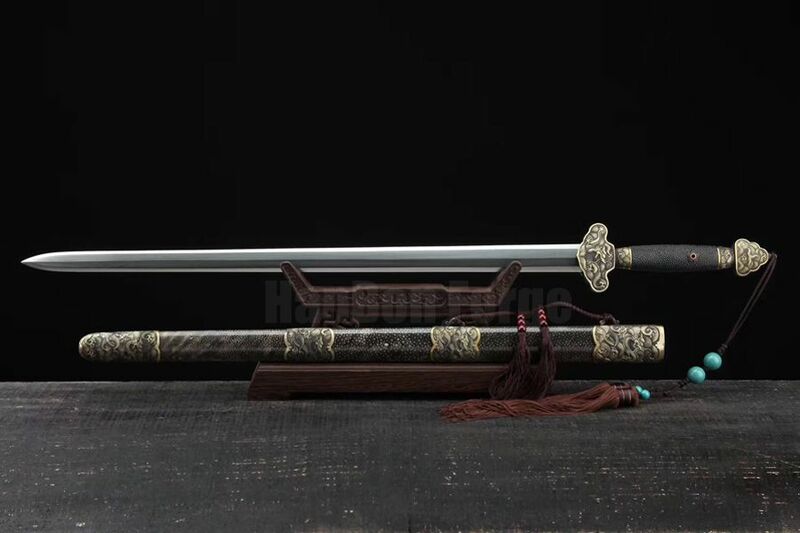 Its scabbard and handle are handmade with high quality rosewood and it comes with sword bag and certificate of authenticity. 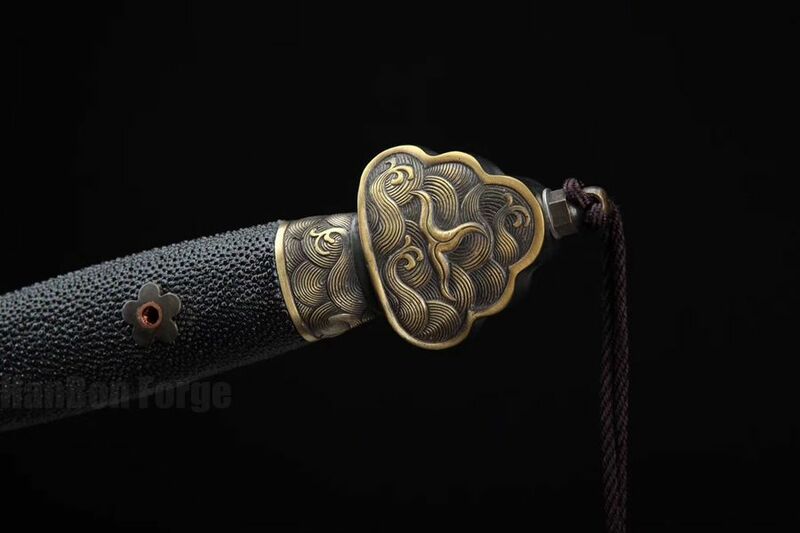 The tsuba, fuchi, scabbard tip, scabbard mouth and kashira are all made of solid brass with lion patterns. 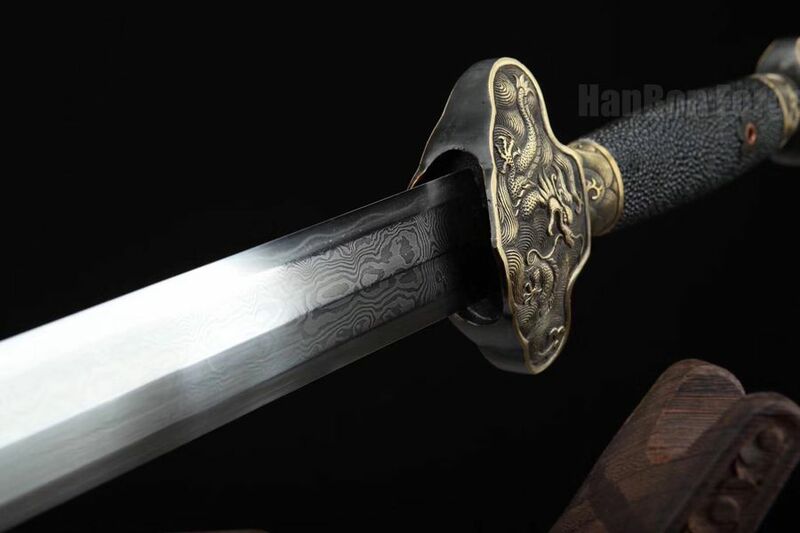 Lion Jian Chinese Sword Damascus Folded Steel Hazuya Polish.. This Jian sword is made of Damascus folded steel, 13 times folding process makes the blade a better cutter, flexibility and more durable. The hamon is authentic all the way up to the tip. 13 times hazuya polishing process makes the hamon and more visible, bright. 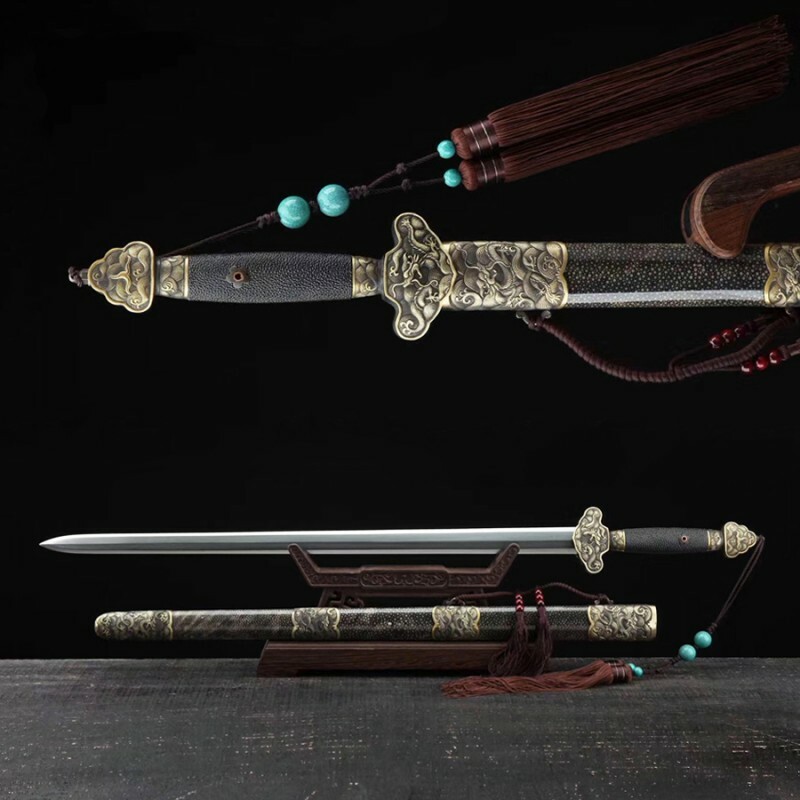 This Jian sword can be used by advanced Tai Chi practitioners, Kung Fu stylists, or those who may want to test its cutting capabilities. 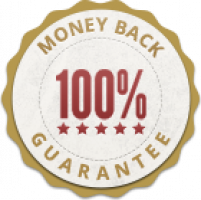 Hand carving guard, fuchi and fittings are all made of brass with the highest standards. 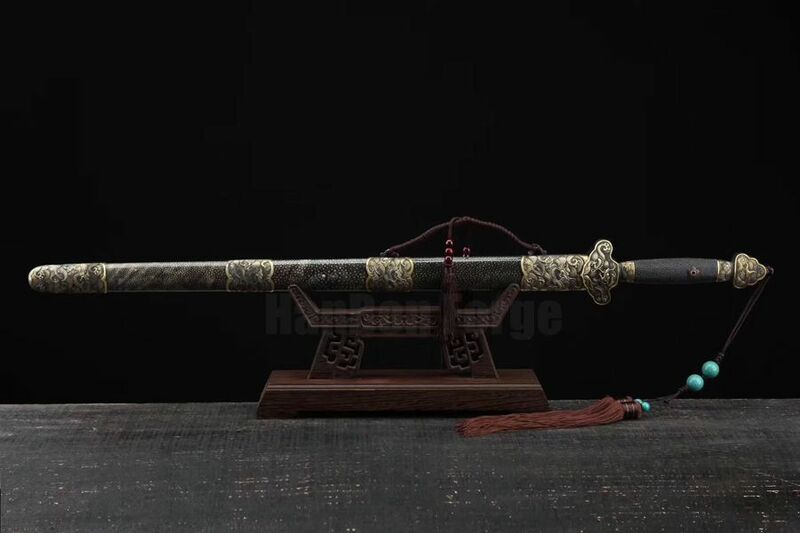 This Jian ..
Ganjiang was a swordmaker who made two very famous swords during the Spring and Autumn Period. Some sources say that Ganjiang and OuYezi had the same teacher, while others claim that OuYezi was Ganjiang's teacher and his wife Moyie was OuYezi's daughter. Either way Ganjiang is the second most famous swordmaker in the long history of China. 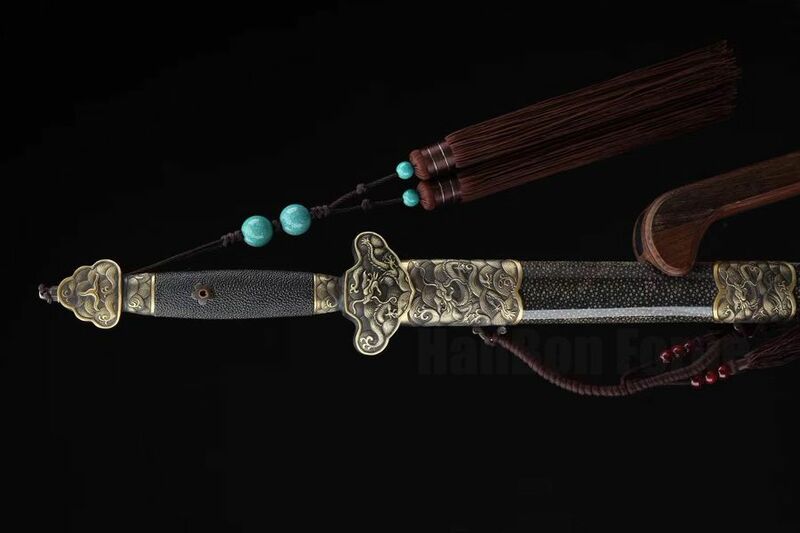 This Ganjiang Sword Jian is made of Damascus folded steel with 12 processes hazuya polishing. There are beautiful grain pattern (HADA) with visible layers on .. 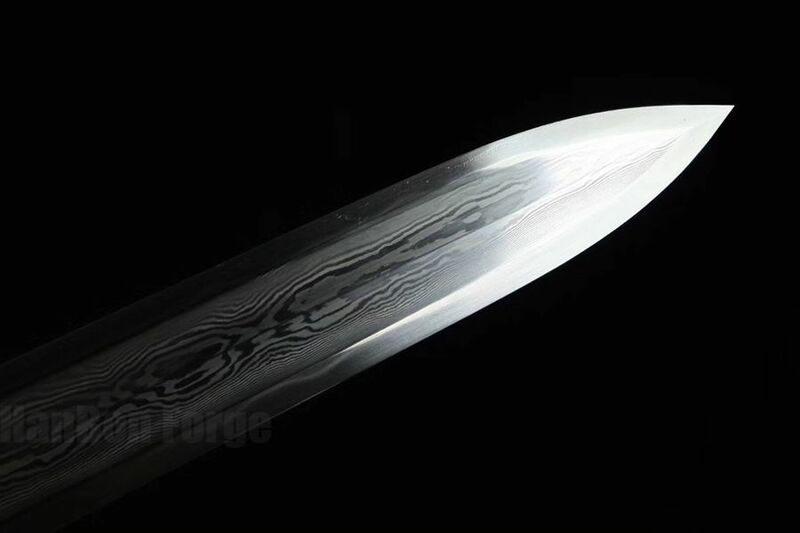 This Chinese sword Jian is the result of Damascus folded steel blade, it features beautiful grain pattern (HADA) with visible layers because of 13 times folding-process. The blade comes no-hi (blood grooves), full tang and very sharp. This extremely tough blade will not easily bend or take a set due to the superior heat treatment of the steel. The scabbard and handle are masterfully made with rosewood, with the wood contouring to the shape of the sword. Its sword guard, seppa and matc..